Going into Celeste & Jesse Forever I expected something more along the lines of (500) Days of Summer than maybe The Break-Up but that is what we have here doused with plenty of indie flavor. There is nothing wrong with that, I always enjoyed the latter film to a degree it didn't receive credit for. If for anything for the fact it skewed the nicely wrapped ending of formulaic romantic comedies for a more honest and brutal look at relationships. Celeste & Jesse Forever can be commended for the same thing. While the film has been marketed as a hip, introspective look into modern relationships it doesn't exactly go against type as much as one might expect. I was rather surprised to see so many staples of the standard romantic comedy show up here, but they do. Still, what this progressive love story adds to the mix is a touching bit of realism in its character development. These aren't archetypes we're watching wander through a very contemporary world (except for maybe Elijah Woods gay best friend) but instead they feel like friends we have known for years who can do nothing but sit back and watch as these two make decisions that will forever impact their lives yet don't seem to realize that impact in the moment. The film who was also co-written by star Rashida Jones clearly has some experience with the topic she has chosen to tackle here and it is evident in the way that she handles the small moments both in her writing and her acting. Her performance anchors the film while showing her audience she is more than capable of handling dramatic material. Naturally, we know what the story is here and if you've seen the trailers you have a pretty good idea of the tone that is set. Tone is important here as the striking characteristic that carries the film above everything is its commitment to being an indie charmer for the generation that keeps pushing its limit to maturity further and further back. 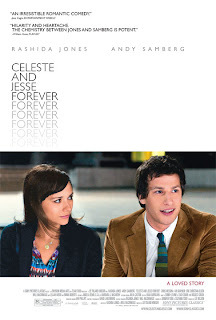 Celeste (Jones) is a successful owner of her own media consulting firm while Jesse (Andy Samberg) struggles to find a sturdy job and would rather be out, catching waves and painting when he feels like it than maintain any sense of real responsibility. They met young, probably early in college and married early because why not? They are best friends and that is the hard part, that is what matters. The rest will come with growth. Thus come the issues when both are entering their early 30's and are growing apart. It would have been interesting to see how the couple survived in the early days when Celeste was starting her business and Jesse was doing what? Supporting her emotionally? The film skips all of this though and picks up after the couple has decided to separate and now hang out because there are no strings attached to simply being friends. They can get along this way when there is no further responsibility other than to make each other laugh, and it works if only for a while because no matter how bad Jesse or even Celeste want to try to avoid it, they have to grow up at some point. There is also plenty to love in the supporting category as the always pleasant Ari Graynor and underrated Eric Christian Olsen show up as Jesse and Celeste's best friends from college who are preparing for their own wedding. Also, is it a requirement Chris Messina show up in every indie romance? He seems to have a great track record with these things but is so charming you can't hate the guy for it and he turns up again here as well. It's also worth mentioning Emma Roberts showing up as a client for Celeste's company as a Kesha like pop star who is basically used as a plot device to expose the layers of which our lead character relies on to make herself feel superior and thus doomed her relationship. leaving one another to be a difficult task. The heart of the film though truly is that issue of how to stay true to one another when you know that things are over. It is not the more common question of can lovers remain friends successfully as the ad campaign suggests but instead it digs into the psychology of why it doesn't stand a chance of working and if it is attempted why that can sometimes hurt more than simply making a clean break. As Jesse, Samberg also shows more range than he has even been required to do so far in his career. 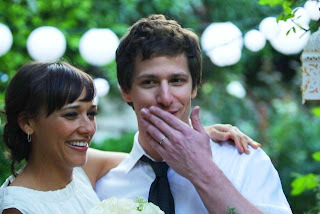 I have always enjoyed Samberg's antics, but they have never seemed to be more than that even in his feature film roles. He is a naturally funny guy with a voice and persona that you instantly recognize as being humorous and Samberg is smart enough to know how to turn that so when he hurts it is all the more clear how painful what he has to do really is. As Jesse the actor has to not only realize what the best thing for he and Celeste is in their relationship but he also has to face the fact he can't escape responsibility. 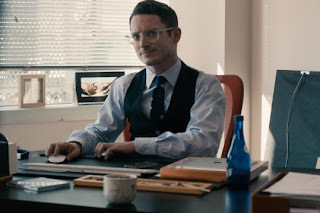 In a somewhat surprising turn, the screenwriters throw in a deciding factor that can do nothing other than force someone to grow up and the complications that come along with it create a complex amount of questions for our characters to work through and address. In this regard the film rises above those rom com cliches and delivers moments of real hurt and insightful moments that teach them as well as anyone watching that has experienced something similar that we cannot always opt for the choice that feels right in the moment but instead have to step back and make a decision that will be best five or ten years down the road. There are a lot of in-the-moment decisions made in this movie and while it does bring an honest feel to the way Celeste and Jesse deal with their divorce it also makes us question the authentic feelings that make that one person stand out as the one you want to be around more than any other. his friend plenty of relationship advice. Celeste & Jesse Forever rises above the crowd of films about relationships in my books not only for its genuine interpretation of how we deal as a race with what we want out of love, but also because it documents the progression of pain in such a delicate way. The back and forth, the looking at the situation from hundreds of different angles, the regrets, the memories; all of those things that we consider after ending a relationship and influence us to go back to that person. Jesse and Celeste can't escape those memories, they can hardly escape the fact that everything in their universe tells them to be together yet they reach that point where they step back from how overwhelming their emotions are in the moment and realize that no matter how good of friends they are or how many memories they hold together neither of them will be able to take care or nurture that relationship the way the other needs them to. In this aspect I applaud the film for not falling into the trappings of a stock script, but instead staring down the influences of real life and taking them into consideration. It is a refreshing move made ever better by the lead performances of Jones and Samberg. They make the film, for the most part really affecting and at other times really funny. The chemistry is there and the back and forth rings so true it is hard for us to choose a side (something the movie never asks us to do) but it also exposes the ugliness in each when pushed to the edge of confusion and frustration. The characters are genuine, the progression is natural, and the epiphany is grounding with the realization we cannot always love only with our hearts. If forever was a moment Celeste and Jesse would be perfect, unfortunately their moment seemed to have come and gone without them realizing.